A long time ago in a fast food restaurant not so far away pizza was once sold alongside chicken McNuggets and big Macs. Yes that’s right McDonald’s used to sell pizza. 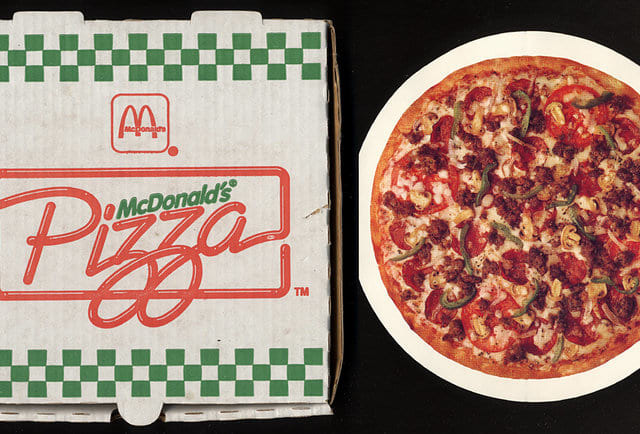 From the late Eighties to the early Nineties in the U.S. and Canada the McPizza was sold far and wide but during the dawn of the new millennium it disappeared from menus as it simply took too long to cook. However tireless fast food connoisseurs have managed to track down two McDonald’s locations in Pomeroy, Ohio and Spencer, West Virginia that still sell the McPizza. They have pizza at McDonald's!!! Now these junk food junkies take long road trips to these particular McDonald’s to get their hands on a slice of pizza that time forgot. This month, three Canadian men in their 20s travelled over a thousand miles just to get their hands on a pie in West Virginia. One of the men who made the epic pizza pilgrimage, Mitchell Boughner, 25, told Vice Munchies about his ‘stupid’ plan. Before we even left I said this was a stupid idea—but that was the whole point, right? Both restaurants selling the pizza are run by franchise owner Greg Mills, who never stopped selling the pizza when the rest of the country did. He offers two sizes personal pizza and family pizza with delicious toppings including cheese, pepperoni, sausage, onions, mushrooms, and green peppers. Buying one of these won’t break the bank either with family size going for $6, while personal pizzas are between $2.75 and $3.25 depending on toppings. Would you trust Ronald McDonald to make you a pizza?